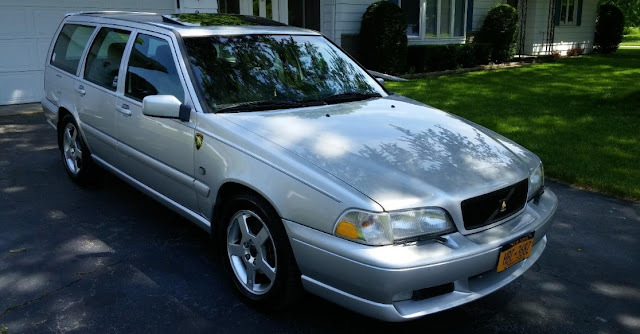 by Kevin -- With only around 500 brought to the US, exclusivity is the name of the game with this 2000 Volvo V70R. When new, the $40k+ sticker price included Haldex AWD, 16” wheels, vented rear discs, dual outlet exhaust and faux suede seat inserts. Most importantly, it also got you the 261hp, turbo 5 cylinder engine capable of hauling this wagon to 60 in 6.5 seconds. Mamma Mia! If you are interested in buying this 2000 Volvo V70R for around $3,500 located in Rochester, NY please e-mail DT directly at tips@dailyturismo.com. 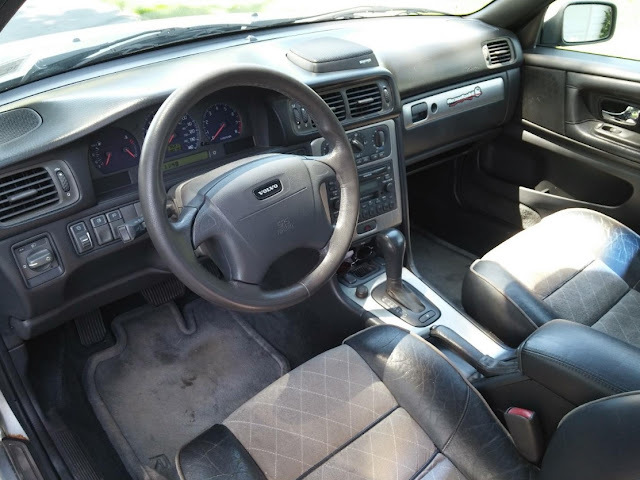 This car is a mostly original survivor with 180k miles on the odo. It is still wearing its original 16” Pegasus wheels and has a fifth as a spare. The right front fender was replaced with an OEM part after a parking lot incident. The entire front clip and front doors were re-painted at that time. The result is a subtle two-tone effect, going from front to back. The grilles have been blacked out and charging moose stickers decorate the fenders. This car is just starting to exhibit some of the symptoms of needing transmission solenoids repaired or replaced. These include an occasional harsh downshift or a little engine flare on an upshift. There is also an unidentified bearing whine as well as a slow but steady leak from the rear differential. These last two items may be related. The turbo still makes good boost and will put a smile on your face when you keep your foot in it. Recent rotors, pads, and flex hoses make for confident stops. Four new Continental winter tires were installed last winter. The dark leather/light Alcantara seats show some wear and cracking, but are intact with no splits or tears. The 3 CD changer is still changing CDs and comes with an additional magazine. All buttons and features are working, including the headlight washer and wipers. The A/C blows cold in the summer. The heater core has been replaced and the heated seats are quite warm in the winter. With so few of these R models still on the road, missing this one could be your Waterloo. $3500 and the winner takes it all! Kevin is an avid, but horrible golfer. He has an unusual fascination with T-tops and enjoys swimming with dolphins. Two of these things are true. "I have a dream" about this car, and for sure "I do, I do, I do" like it. However, "Knowing me, knowing you", "One of us" will have problems with "Money money money" if an "SOS" situation happens. That is always "The name of the game". "Gimme, gimme, gimme" a "Ring ring" and we can discuss it. Mama Mia dat was funny! These are gorgeous cars. In my opinion, probably the best looking Volvo of the past 20 years. One area of concern is that I see some rust on the front door sills, makes me wonder how the rears look (where the side skirt meets the door sill area). The metal is good on these cars, very rust-resistant even without paint. It's *likely* surface rust but a prospective buyer is probably going to want to see more detailed shots of the common rust areas. They're 16" Satellite wheels. Pegasus was offered in 17" and 18" and was not introduced until 2004 with the P2 S60/V70Rs. Love the two tone seats, same as in mine. GLWS!